No good deed goes unpunished for Miss Julia. Like any good friend, Miss Julia is always willing to pitch in. But she’s taken aback when she learns that Miss Mattie Freeman, who’s fallen and broken her hip, has given her a general power of attorney. No sooner has she heard about this unsought honor than the unfortunate Miss Mattie dies, leaving Julia in even more of a pickle when her friend’s attorney informs her that she’s also the executor of her will. Miss Mattie’s left a long string of bequests to her people, her church, and her charities, and although Julia is loath to take on the job, she knows that if she doesn’t, the meager estate will have to pay someone else to do it. 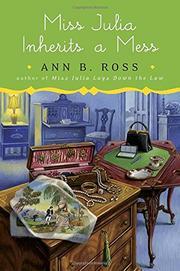 With the help of one of her still-living friends, she finds an appraiser to help value the items that fill Miss Mattie’s apartment while she takes on the task of sorting through years of paperwork and collecting the small items that are supposed to go to charity. Enter Andrew Cobb, who claims to be a long-lost relative. He has no plans to contest the will but asks to see Miss Mattie’s family papers and the needlework he claims she was famous for. Julia is pleased to learn that some of her friend’s furniture is quite valuable but horrified when someone steals a lovely little cellaret. With her husband away on a fishing trip, Miss Julia enlists a friend to stay with her at night in the apartment until the auction gallery picks up the furniture. Gentle complications follow. Slow as molasses, Miss Julia’s 16th (Miss Julia Lays Down the Law, 2015, etc.) barely qualifies as a mystery, counting instead on Southern charm to delight the fan base.